A new off pavement touring route that has been devised in Baja. Anybody here have any experience with it? It looks super cool, but I wonder if panniers would be okay and if there is any danger from banditos. I have toured off pavement between many of the points the site mentioned in Baja Norte. Riding in the Sierra De Juarez mountains in the North, a 47mm/1.75 tire worked well except in the sandiest areas near Laguna Hanson on a rigid bike. I expect their 3 inch tire width recommendation comes from riding the routes churned up by motorcycle, quad and jeep where the Baja 1000 race was often routed around the area below the Parque Nacional Sierra De San Pedro Martir. Along the Sea of Cortez and further South to Bahia Gonzaga, Bahia Calamajue and then West out to Laguna Chapala and on to Cataviña saw an increase in rough route surfaces. Riding those areas in December brought frozen water bottles at 5000 feet, high winds at times, brief night rain with the overnight blooming of Boojum trees, Cirio cactus and many other desert plants then heat spells for a week. Had to carry lots of water and food with few services where ridden. But well worth the riding. I look forward to seeing this new route when the maps and GPS appear. Thanks arctos, thats good beta.Did you use panniers or frame bags? I would be concerned about... A) As far as I could see no map/ mention as to what distance per day/ how far between towns. And B). Running over a lot of thorns and running out of tubes/ patches out in the middle of... nowhere. I told the bandidos that Yullie had already stolen all my money. They said she stole their money aswell. She looked really good as all our money disappeared though. They gave me 2 tacos and a burrito instead. 2.5 tires are not wide enough. The thinner they get the harder it is to push through the sand. It is a hard ride. If you survive, you will go back again. I like to repost this story now and then. May have been 2010 when I wrote it. 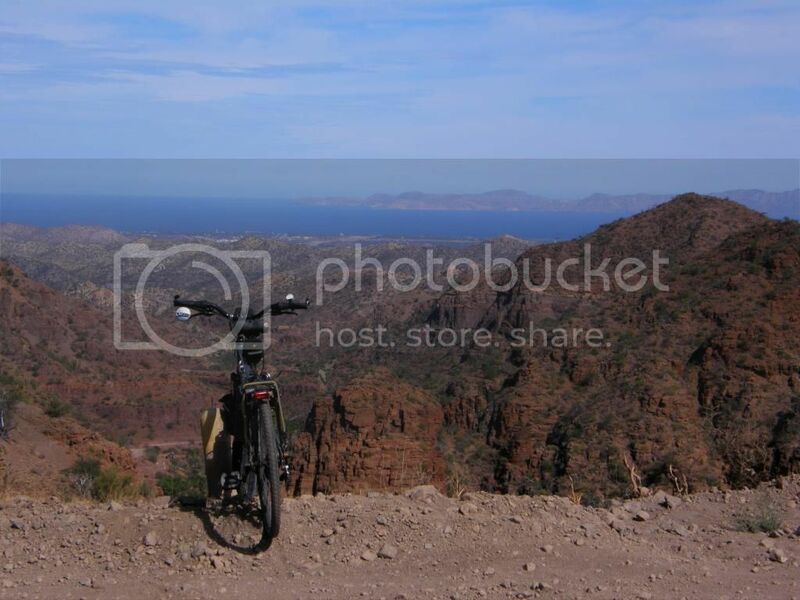 Pedal a bicycle into the mountains. The Sierra Pedro in Baja. At the last tienda before the pavement ran out a guy in a funny hat said [ back, you go back ]. All right, he really broke a stick into pieces in an attempt to show me what to expect from the road. I have a good stock pile of water, three days worth. Route finding should be easy, my map shows only a couple of roads. The road follows the river, river of sand. Soft sand great for camping. A little hard to pedal in though. With most of the water gone my bike gets a lot lighter and easier to push through the sand. The canyons in the lower foot hills are, worth a look. The pools of cool clear water appear, and flow under ground again. The caves show signs of human use for thousands of years. Lost on the wrong road. A blessing. A wonder land. people know not from wince they came. The caves show signs of human use for thousands of years. Another day, I meet a man in a truck, taking some sheep to market. Sir, is this the road to San Pedro? Taking his hat of, he puts his hand on his head and shakes it no. There is a language barrier. He is pointing and then motioning to go left. This becomes the daily routine. A man invites me into his mountain home for coffee. Adobe bricks, palm frond roof, dirt floor. His wife makes the best coffee. When I ask about the road to San Pedro, he motions that I have to go up up up. With a stick he draws a map in the dirt. He talks on his CB radio. The only words I pick out are Americana, and San Pedro. He says the odd motor cycle passes this way, but this is the first bicycle to pass by. Sometimes the road is fist sized rocks, sometimes football sized rocks., other times, hard packed dirt, always more sand. Some times I pedal sometimes I push. My map does not show all the roads all the small ranchos. I am told there are many ranchos that have no road. Every person I meet asks if I have food and water, I do, yes. One afternoon; I accept an invitation to lunch. Rice with small pieces of tomato cut on top, beans, tortiass, and coffee. The plates look like depression glass, the kind my great grandmother had. I try to use my best manners and eat only a little. His wife and two daughters are beautifull. His open air, palm frond roofed dinning area separate his sleeping quarters, and his dirt floor kitchen. on the way out I hand him 50 pesos. He reaches back from his chair and picks two oranges and a lemon for me. There are some fine horses here. Did I forget how to live right? As I gain elevation the road gets steep. I take three steps up, slide back two. and give the bike a push. The cowboys are riding donkeys now. They look at me take their hat off and scratch their head. San Pedro? By know they all heard about the loco gringo crossing the mountain. When was the last time a cowboy stooped to let a bicycle go by? I find gates open, 100 feet up the mountain I look back and see a man close the gate. I see five more cowboys in leather chaps push a tree branch aside and ride donkeys out of a rocky creek bed. Muchos ranchos no camino. Is the mountain to much for me? No. I can make it. Dark this early? Full moon, winter solstice. I have to make it to the top. Going down is not so easy. I have modern brakes, they are no match for the mountain. miles go by, at last a flat spot to lay my tired self down. To tired to cook food, guess again. Plain rice never tasted so good. Shortest day of the year. Plenty of time to explore an old mission. My supplies all but gone, my water very low, I can not find the mission water. Two oranges and a lemon, yes! The hills are ride able now. The 29 inch wheels roll over football sized rocks quite well, when I need water, I'm brave on the long down hill. A bridge building crew has running water piped in from Huh? Running water all I want. Drink, wash, all I want. Cool clear water. At last a tienda in a mountain village. Tuna, crackers, cold coke. Does the lady yell at me for having a weeks worth of dirt on my shirt? No. She knows I don't read Spanish, so she puts what I think are crackers back on the shelf, and hands me crackers with a picture of tuna on them, thanks. More miles of rocky down hill, one last camp, last of the 20 patches on my tubes. Only 20 miles of highway 1. Whats wrong with the fat lady in the silver Honda with the California plate, must be her road. Two medium volume Robert Beckman front panniers only, on high mount Bruce Gordon Mountain Rack plus a dry bag stuffer on top of rear rack for bulkier sleep,shelter and clothing.The same setup I have been using for thirty years. It works for me. Lived in Mexico for a couple of years as a kid & immediately fell in love. 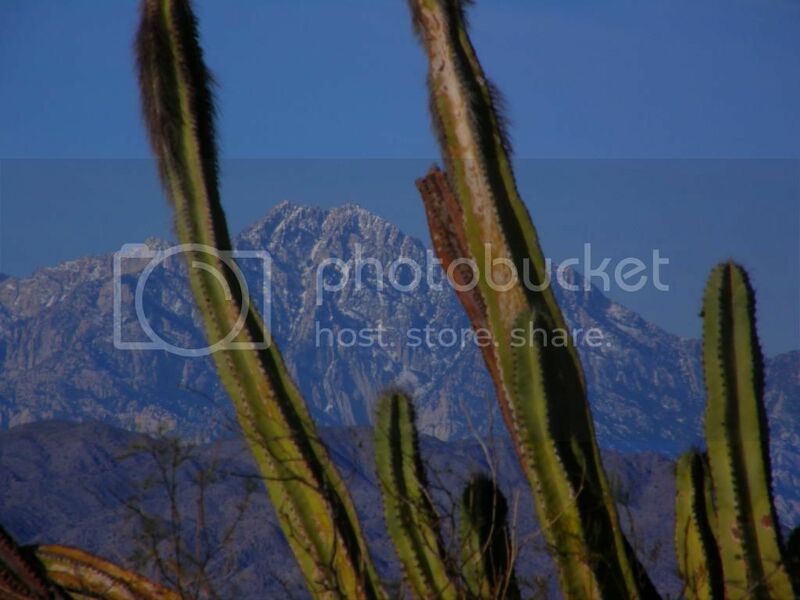 Long car tours thru central & western Mexico were fascinating w/the mountains, deserts etc. With riding partners I think crime would be a bit unlikely. Damn, this sounds and looks awesome. Interesting that they require tubeless tires for the 2017 group ride. Those must be some pretty rough trails. As far as banditos go, most of my friends and family in Mexico tell me that the Baja peninsula is relatively secure. Take that with a grain of salt and do your research, but I understand that once you've gotten away from the border, you're pretty safe. Why are tubeless tires better for thorns? I'd like to go on this ride, I don't know if panniers or frame bags are better and still concerned with public safety. R.I.P. Eli Wallach. I once rode through the Tabernas Desert near Almeria during a tour of Andalucia, Spain. Much of "The Good, the Bad and the Ugly" was filmed there. (The cemetery location was in northern Spain.) I could help yelling out "Blondie!" over and over again. : )) Blondie, I'm going to keel you. Lots of cactus & thorns; I haven't used tubeless but it's supposed to be great against that. Lived in Mexico for 2-1/2 yrs & visited twice later (Baja then Mexico City & Acapulco). Only crime I saw was an inattentive friend that got pickpocketed on Mex City subway. Yanquis think Mexican cops are all corrupt & inefficient but that's not really true. If one obeys the rules it's unlikely for tourists or even locals to get stopped. On the Mexico City-Acapulco drive my friends got stopped 3 times for legit violations, their own fault basically. Anyway, seems as if only the most desperate criminals would openly rob foreign tourists. On the Mex-City/Dallas plane trip I met an American woman who researched regional Mexican cuisine--she traveled to small towns by herself w/o problems. 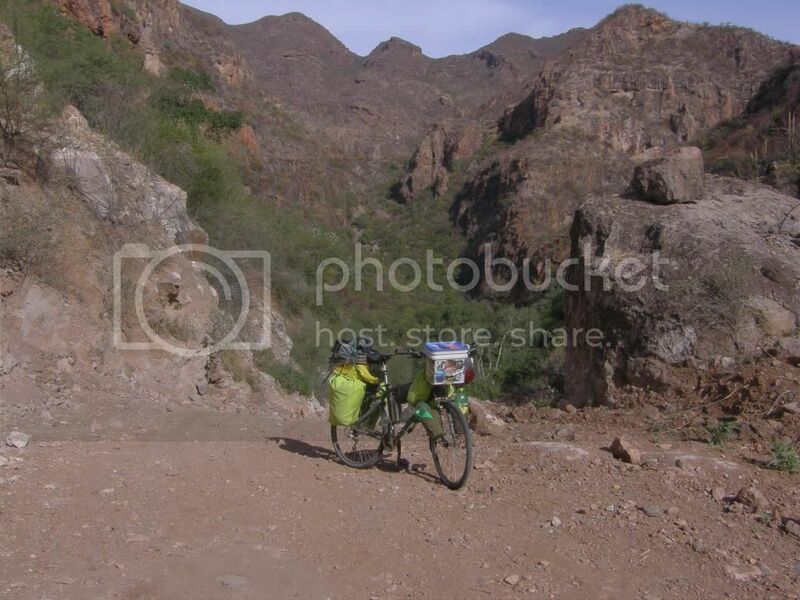 The biggest problem I had riding the back roads of Baja was- people keep trying to give me free beer. I don't drink. If I asked for water they would give me some. Seems the farther I get from a town the more often someone stopped their car and tried to give me ice cold beer. Eventually I solved the problem by going places cars can not get too. Beer yuck! I like going some place other cycles have not yet been. "The place is desolate and foreboding, we do not understand the allure. If we live we must go back"
Would putting some sealant in your tubes be just as good as a tubeless set up for puncture protection for thorns? Why are tubeless better for thorns anyway? Wouldn't something like a Mr Tuffy work better? Trust those that have been there. You need tubeless. Sealant in the tubes is not a good solution. Do your home work on this one boys. Tubeless has a high learning curve. When you get it you will be happy. Don't belive every thing the sales guy Stan says. It works. It does not work miracles as Stan wants you to belive. So why wouldn't sealant in tubes work just as well? AFAIK the tubeless sealant is more reliable, I'd guess because a thicker tire allows more depth for the sealant to fill vs a thin tube. I've found Mr Tuffy great vs glass but it might be vulnerable to big thorns or frequent tire wires. Plus tubeless is supposed to eliminate pinch flats which seem possible on rough tracks. I'd use wide tubeless tires & preferably a suspension MTB too. A lot of even dirt roads in Mexico are pretty good but conditions can vary wildly. Surprising about the beer offers. In Tijuana I saw strict enforcement vs drinking on the street. Mexico is a haven for soda pop connoisseurs w/real sugar/glass bottles/many fruit flavors. I know it's not healthy but a cool reminder how USA pop used to be. Mex Orange Crush with taco lunch is true gourmet, heh. I do not get thorn flats with my tubeless set up. Or pinch flats. One needs a true rim and TR tire to set up properly. Hacks can be made but vary with reliability. I understand that once you've gotten away from the border, you're pretty safe. This is true about Mexico in general. The dangerous people are the cartels, and they're not worried about some guy riding a bike - they're worried about each other. Most of the violence happens near the border because that's where trafficking happens. A good plan: spend the night as close to the border as you can before crossing over (in San Diego, I suppose), then cross first thing in the morning and put Tijuana far behind you before you stop for the night. One day of riding and you'll be out of the danger zone already. the roads were great, the not roads.... well I sometimes rode in riverbeds because they were nicer than that was considered the track.